This is an original 1973 UK FIRST PRESSING 28-track double vinyl compilation LP, housed in the front and rear laminated gatefold picture sleeve with matching blue lyric inner sleeves. Labels state catalogue numbers as PCS 7181 and PCS 7182. The sleeve reveals very little, if any, shelfwear just a little foxing to the opening sides, particularly for a 46-year-old, with no tears, stains, splits or writing and the lyric inner sleeves are also in EXCELLENT+ condition throughout. Record 1 is in amazing NEAR MINT condition throughout whilst the companion Record 2 remains in strong Excellent+ condition. A TRULY EXCEPTIONAL COPY OF THIS SOUGHT AFTER COLLECTION! After all, you're not the only one who leaves it till the last minute! In the highliy unlikely event that something does go wrong you can speak to a REAL person about it! And the main man to boot!! Our UK warehouse is stacked from floor to ceiling with bulging racks of vintage vinyl and CD goodies. We have an ever evolving collection of saught after memorabiliia and autographs. Unlike most sellers we have an actual bricks and mortar high street shop. Here you'll find a cornucopia of rare CD's etc and one of the finest selections of quality vintage vinyl around. All my items are graded according to the Record Collectors grading system. Mint: The record itself is in brand new condition with no surface marks or deterioration in sound quality. The cover and extra items such as the lyric sheet booklet or poster are in perfect condition. EX (Excellent): The record shows some signs of having been played but there is very little lessening in sound quality. The cover and packaging might have slight wear or creasing. VG (Very Good): The record has obviously been played many times but displays no major deterioration in sound quality despite noticeable surface marks and the occasional light scratch. Normal wear and tear on the cover or extra items, without any major defects, is acceptable. Steel-Wheels is one of the most respected names in the music retail industry having traded successfully in 4 bricks and mortar shops in Newcastle and online for almost 25 years. Heres just a few of the accolades weve humbly received during that time. NME Best independent Record Store in The UK 2003 FLIPSIDE Best Record Store in The UK 2001 THE INDEPENDENT Best Independent Record Store In The UK 2004 Galaxy Radio Record Store Of The Year 2008. We have an ever evolving collection of sought after memorabilia and autographs too! 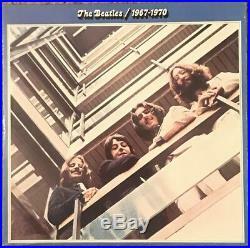 The item "THE BEATLES 1967-1970 Rare 1973 ORIGINAL FIRST PRESSING UK Double Vinyl SetNM" is in sale since Wednesday, January 23, 2019. This item is in the category "Music\Records". 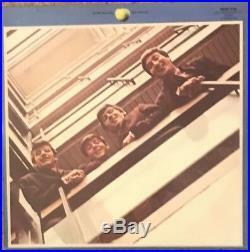 The seller is "geordieboy53" and is located in NEWCASTLE UPON TYNE, Tyne and Wear. This item can be shipped worldwide.